Skip the coffee. 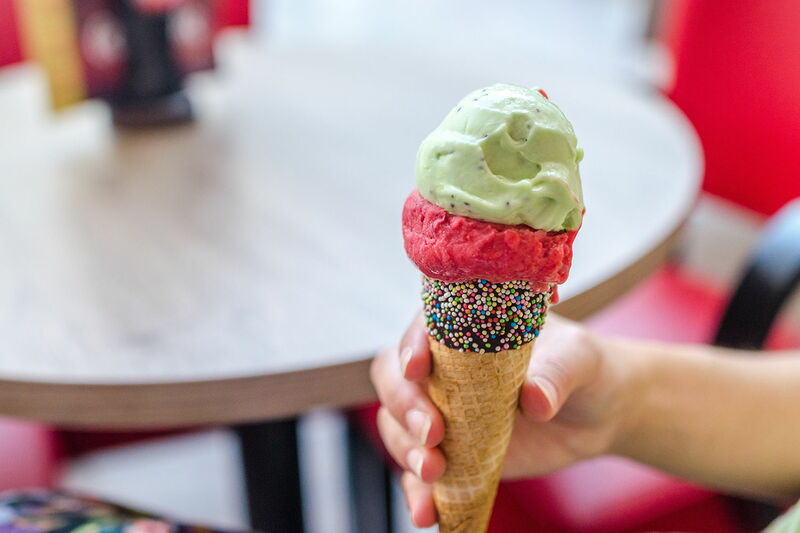 Take your next business meeting to the ice cream parlor instead. Ursula Mead, founder and CEO of InHerSight, shares creative ways to make a strong first impression and build authentic, lasting connections in the workplace. Back in July, I shared this small suggestion in a much bigger article about the importance of networking. But, for a lot of reasons, that little nugget of truth about my own life — afternoon coffee meetings make me jittery, and I like ice cream – got plenty of attention. I started fielding regular questions about ice cream meetings and jotting down more than the usual number on my calendar. And as I contemplate what flavor to get next, all that interest also got me thinking about the purpose of meetings and the importance of breaking out of the routine — whether it’s the boring old coffee routine or grabbing an after-hours drink, which can be especially tricky in these #MeToo days. After all, not every business meeting is about ticking off some task on a checklist. In most cases, that meetup is about building relationships — whether you’re jockeying for a promotion, vying for a dose of funding for your startup or simply strengthening your network for future opportunities. Your goal is to build authentic and productive relationships. To do that, you must make an impression. Admittedly, this can be hard to do, especially for mixed genders in the world of #MeToo. More than half of Americans say recent developments have made it more difficult for men to know how to interact with women in the workplace, the Pew Research Center says. But, for me, as I meet with prospective employees, investors and partners, I know it’s critical to do the hard work to build the valuable business relationships that will move my company and career forward. And that means I often get a little creative. If you’re ready to swap the same old coffee meeting with something memorable, here are five alternatives. For me it’s ice cream, but it doesn’t have to be. It could be a doughnut. Or bubble tea. Or maybe a visit to the food truck that pulls up weekly at your office complex. Whatever it is, it should be universally loved (like ice cream!) or a passion of yours that you can share with your contact. The whole point here is for them to get to know you better so you quickly come to mind as they’re deciding, weeks later, which business to invest in or whether anybody in their network is the right fit for a vacant position. There’s a good chance that melt-in-your-mouth bacon maple doughnut will be more memorable for your contacts than the latte they ordered at every other meetup. Instead of focusing only on the task at hand, a meander through an art gallery or museum could provide a contemplative place for you and your connection to really get to know each other. As you chat about hot topics in the industry, your growing business venture or shared connections, you can weave in talk about the paintings, sculptures and other interesting pieces on display. Shared experiences like these can open up a conversation and are more likely to make a lasting impact in ways that probably would never happen over some java at a coffee shop. In the office, standing desks are all the rage as we try to eke out a few more minutes of activity in our busy lives. Why not incorporate a little exercise into your next meeting? It feels like a lot to ask someone to go to the gym with me. I am all about comfort and inclusivity. But that doesn’t mean every meeting has to be sedentary. Instead of sitting at a cafe for an hour, take a walk around your neighborhood or at a nearby park instead as you discuss the issues at hand. Generations have met over a game of golf. But if you’re not a golfer — or don’t have hours to kill — you have plenty of other options. Pick something low pressure that accommodates talking like backgammon, Connect 4 or bocce ball. It’s helpful to find a game that most people know how to play, that fits into a typical meeting time and permits some multi-tasking. If it’s a longer meeting or you’re really feeling it, consider an adult arcade. Maybe there’s a park with great benches or an open rooftop bar and restaurant with a view of the skyline. Your scenery can impact the whole view of the meeting. Bustling parks make you feel productive and energized. Sweeping vistas help you dream big and get excited. Take advantage of the nearby energy to fire up your next meeting. Of course, the beauty of a coffee meetup is that it’s relatively easy. As you set up alternative plans with your connections, remember a couple golden rules. Make it convenient for both parties and nix any options that come with unpleasant costs – both time and money. Ursula Mead is the founder and CEO of InHerSight, an anonymous company reviews platform where women rate the female-friendliness of their companies and get matched to companies that have what they are looking for. At InHerSight.com, millions of women have researched company cultures and benefits. This article was originally published on BizJournals.com. It’s easier to sell ice cream.